3. 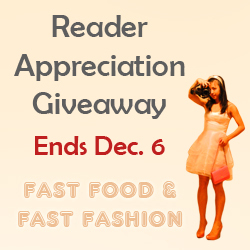 Elle @ Fast Food & Fast Fashion is also hosting a reader appreciation giveaway. I adore her style. I feel like I've learned so much about the clothing brands through her blog. This giveaway ends Dec 6. 5. Twenty York Street is giving away this gorgeous BR statement necklace. 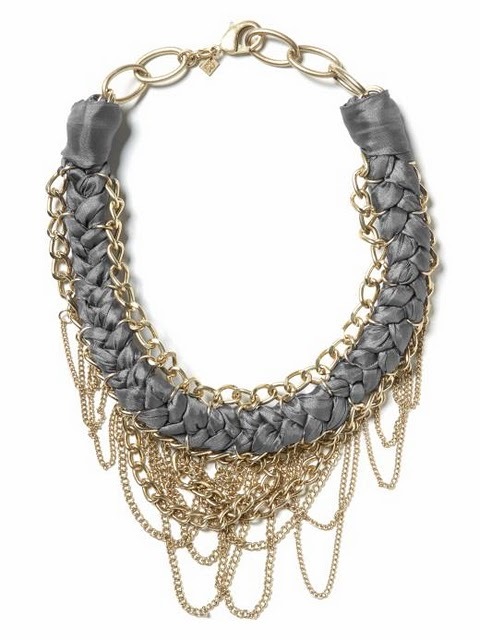 It would be a great piece of jewelry to have for the upcoming holiday seasons. 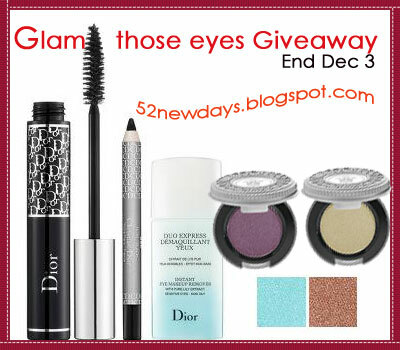 This giveaway ends Dec 5. I know there are several petite bloggers planning to host their giveaway in the very near future. Stay tuned! See my previous post for a list of giveaway that will ended soon. 3. Colehann outlet store: I have been wanting a pair of Colehann riding boots forever. This is a perfect opportunity for me to pull the triggers. They are having 50% off the entire purchase on Black Friday. If you shop from midnight - 8:00AM, you can take another 20% off on top of that. That is an incredible deal. I already called the store and have my boots on hold. I have to get up and go to work early tomorrow. I'd like to get things done in the morning so I can get off work around lunch time and start my holiday weekend. What is your shopping plan for Black Friday? If you know any good deals, please feel free to share on here or Twitter. To everyone - I'll be hosting another next week, so stay tuned! What a perfect post! Guess what? For the first time ever, I plan to partake in this infamous annual Black Friday crazy sale! We plan to drive from Canada and see all these great deals! More info on deals and coupons will be greatly appreciated Syd! congrats Angie on winning the giveaway!! and so many giveaways going on right now that it's so exciting to see a new winner so often. and i can't wait for black friday too! hopefully hitting up the outlets! And congrats to Angie on winning! Thank you Sydney tor the shout out. So many wonderful giveaways! Congrats to Angie as well. It is soooooo quiet at my office today and I will get to leave around 3pm to pick up my little one from daycare. Happy Turkey Day and enjoy this memorable time with your family. You will need that extra energy for Black Friday shopping madness ;) I can't wait! YAY! Congrats to Angie! Lucky lucky girl!! Happy thanksgiving! I will also be going to the outlets at midnight. If you check, some stores open @ 9pm. hahaha. 1 of the outlets near me, the Ann Taylor factory Outlet opens @ 9pm. I want to get all the small sizes! good luck on your hunt. I eagerly await a post on what you got and your fitting room finds. I've done Black Friday at the outlets before, total chaos and lines out the door! @_@ never again, just gonna stick to the mall this yr! Have a happy Thanksgiving! Thanks for posting about the giveaways and outlet BF deals! I am soooo toying with the idea of going to Cole Haan - I always hear such good things about their Nike technology in heels. I believe Gap is also having additional 50% off from 12 am to 8 am. Ack - forgot to congratulate Angie on the win! @Really Petite You're very welcome, Annie. Happy shopping! @AubreyOhDang! 9:00PM? That is crazy but probably is a good idea. Small sizes sold out fast (especially with an additional 50% off). @SewPetiteGal Those Colehaan shoes are the best. They worth every penny. I definitely will be checking out those Gucci shoes too. I really hope they still have my sizes in stores. Are you anywhere close to the Cincinnati premium outlet? Oh boy! We've developed a strategy, we leave Canada and drive to the border by 9 p.m., hopefully we can get through pretty quickly and hit the first stores by midnight! I will be closely following your tweets! And, thank you for posting the give-away - it'll be the more, the merrier! I had no idea all of these giveaways were going on and I read these blogs!! lol Thanks for posting and Happy Thanksgiving!! It is really so awesome that you do this for us! Thank you so much... off to check out all the giveaways now! Hope you have a great time Black Friday shopping and score some amazing deals. I am pretty jealous I'm not American... my bf and I are seriously considering making the drive down to Washington RIGHT NOW to get in on these great deals! Hahaha.